Whether you need a single poster to display in your home, office or a selection of posters for an exhibition or special occasion, we can produce high quality posters quickly and professionally in-house here in Shetland. Poster prints are from 11”x14” (28cm x 35cm) to 44” x any length! Banners and Panoramic prints can also be made. All you need to do is bring your photo, slide, negative or digital file in and we'll do the rest. If your image is on a memory card, CD or DVD you can print directly from our state-of-the-art touchscreen kiosks. Sizes listed are nominal, and if we need to do a specific or unusual size to suit your requirements, we will do our very best to do this for you. 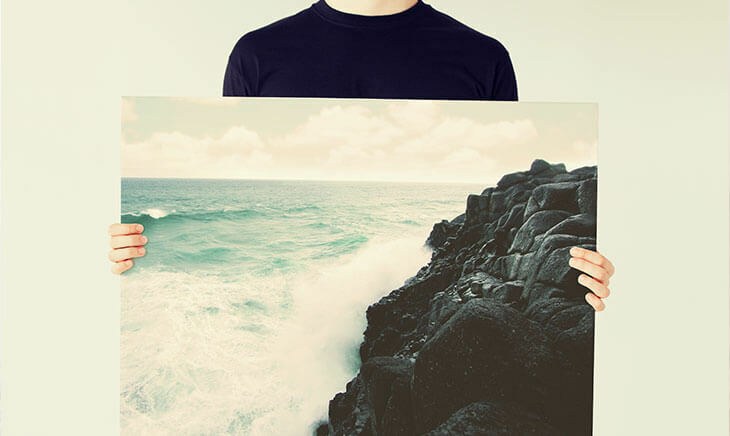 We digitally balance your image before printing onto high grade 310gsm premium lustre paper. Gloss also available on request. Using genuine Epson ultrachrome inks ensures highly accurate colours and archival/fade resistant prints. We print as standard onto high grade 310gsm premium lustre paper. Gloss also available on request. Can you add special effects to my image? Yes we can do many different effects, such as Warhol, Spot colour and many more, see our Digital Effects page or call in store. Service time is usually 3 days but a same-day express service is available on request. *All sizes are approximate, Bespoke sizes - Please enquire.